Biological illustration of the Dall’s porpoise (top to bottom: male, calf, and female). 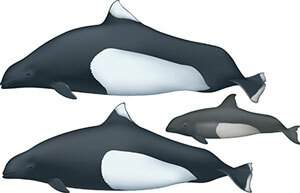 Note their distinctive gray, black and white body color; thick, robust body shape; small head; and small, triangular dorsal fin. Also, the tailstock and caudal peduncle of the Dall’s porpoise are enlarged (compared to other marine mammals), creating a pronounced hump at the tail-end of the animal. Image credit: Uko Gorter and the American Cetacean Society. Dall’s porpoises (Phocoenoides dalli) are only found in the North Pacific Ocean and adjacent seas (Bering, Okhotsk, and Japan/East seas). The species mainly inhabits deep, offshore, waters colder than 18°C. The current population estimate for Dall’s porpoise is more than one million animals. Dall’s porpoises are larger than other porpoise species, growing up to 2.3 m (7 ft 7 in) in length and weighing between 130 and 200 kg (286-440 lb). They have a more robust body than a typical dolphin (ie bottlenose dolphin), a small head, and a small, triangular dorsal fin. The tailstock and caudal peduncle are enlarged (compared to other marine mammals) and create a pronounced hump. Although their body color, dark grey/black with white patches on the belly and sides, is distinctive for the species, it is possible to mistake these porpoises for small killer whales. The porpoises are thought to have a diverse diet, feeding upon cephalopods and small, schooling fishes such as herring, anchovy, and mackerel. They are capable of diving to a depth of 500 m (1640 ft), and are considered the fastest of all small cetaceans, swimming at speeds up to 55 km/h (34 mph). When swimming at high speeds, Dall’s porpoises create fan-shaped splashes of water that scientists can use to identify the species. Image credit: NOAA Southwest Fisheries Science Center. Dall’s porpoises emit short, high frequency clicks that are presumably used for echolocation. These clicks have a peak frequency from 117 to 160 kHz and source levels of 165-175 underwater dB. Two distinctive click types have been observed for Dall’s porpoise. 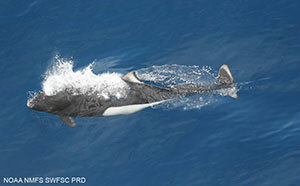 American Cetacean Society Fact Sheet: Dall’s Porpoise. NOAA’s Alaska Fisheries Science Center/National Marine Mammal Laboratory, Dall’s Porpoise. Scripps Institution of Oceanography, Voices in the Sea, Dall’s porpoise. Hatakeyama, Y., Ishii, K., Akamatsu, T., Soeda, H., Shimamura, T., & Takahito, K. (1994). A review of studies on attempts to reduce the entanglement of the Dall’s porpoise, Phocoenoides dalli, in the Japanese salmon gillnet fishery (Report of the International Whaling Commission, special issue No. 15) (pp. 549–571).